This is a stove seen by Dulguun Basaandavaa at Suhkbaatar Square which is a huge plaza in downtown Ulaanbaatar. There was a demonstration of stoves in yurts (gers) a few days ago. This one is particularly interesting for the reason that it is the first small scale Mongolian coal gasifier spotted in the wild. It has a fan so it may be modelled on a much larger device. I have no idea at all how it works. Perhaps someone far more knowledgeable about gasifiers can spot and name the components. In all more than 10 new stoves were shown nearly all of which are downdraft stoves, or which can be started in updraft mode and switched to downdraft. 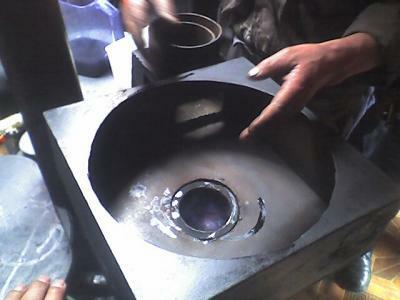 One of them was the previously reported BLUD stove from Inner Mongolia that rotates and becomes a TLUD during the ignition cycle.